Kent Valley Ice Centre, Kent, WA., Thursday, December 6, 2018 - Kent Valley Hockey Association had a great turnout for the December 1st Try Hockey for Free day! A total of 25 new skaters were introduced to this fantastic sport! The next Try Hockey for Free day is set for Sunday January 6, 2019. 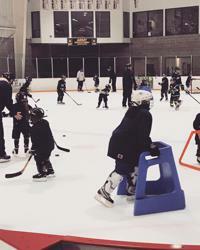 Kent Valley encourages kids, ages 4 to 10, to a completely free experience to try youth hockey. No experience is necessary. Protective gear will be provided. We will have coaches and volunteers to help your player get geared up and on the ice. Kent Valley Ice Centre will be offering Holiday Public Skating Sessions beginning Wednesday, December 18th through the balance of December. These sessions are timed to fall during the Christmas breaks for local schools and provide an excellent opportunity for parents to drop their skaters off for a Holiday Skate while they go shopping. Click here for a calendar of Public Skating Sessions. From new skates to hockey equipment, find everything you need at Kent Valley Ice Centre. The Kent Valley Pro Shop carries a variety of items for hockey players and figure skaters, helping you get the equipment you need to stay competitive on the ice. If you are looking for something specific that you don't see on our shelves, please talk to a staff member. We are happy to help you order a specialty item or find something you like in a different size. Our partner, the Seattle Thunderbirds, can also help you with Christmas ideas for your hockey player. The T-Bird’s Pro Shop can provide Hats & Beanies, T-shirts, Sweaters & Jackets, Jerseys, Trinkets, Tickets & Ticket Specials and Gift Certificates.